Read on to find out how to place order efficiently on our website. 3. You will need to upload the correct file to the website. To locate the correct file format please select the more info link. 4. Click the "Select File" button in the My Account section or the "Upload File" in the shopping basket. You will be able to upload a file from your hard drive. 5. 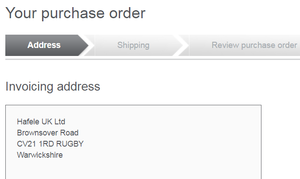 Once you have uploaded the file you will need to select 'Add to basket' to add it to your order. You may add Items to you shopping basket at any time using the "Quick Order" feature. You will find this in the top navigation next to the basket icon. Simply select this feature and you will be able to enter the Item Number, Quantity and the Job Referance (this field is optional). If your invoice address is incorrect please contact our customer services team. After you select a delivery address you will have an opportunity to select a shipping method for your order. You may prefer expedited shipping or our standard shipping option. The associated rates for your order will be displayed for each option. 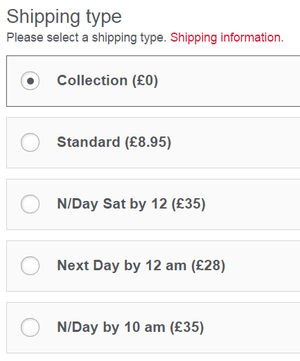 The standard shipping method will be the default selection. Shipping charges may vary depending on the item. You will see these charges on the order review page. In some cases you may qualify for FREE shipping. If so this will be displayed on the place order page. Many of our customers have accounts that invoice directly to their billing address. This is convenient for customers that purchase often from our website. If you would like to have this option please contact our Customer Service team or our Accounts Department. You will have the option to pay via credit card or if applicable you will be able to request a proforma invoice.